This "Historically Speaking" column was published in the Exeter News-Letter on Friday, February 13, 2015. Like Halloween, Valentine’s Day is a holiday that is not really a holiday. Any fourth grader will explain that unless they get the day off school, it’s not a holiday. But like Halloween, Valentine’s Day is more fun at school, so it all works out. Valentine’s Day is also a day one either loves or hates – depending on age and relationship status. So, there are some real mixed-feelings about the day. Whatever your view, it’s hard to ignore the day when everywhere you go there are red hearts and cupid decorations. These were most likely cards designed by Esther Howland of Worcester, Massachusetts. Howland was a recent graduate of Mount Holyoke College and had received a commercially produced Valentine from England, where sending the cards had long been a tradition. Looking for a venture for her father’s stationary shop, she designed and marketed Valentines and is considered the founder of the practice in the United States. In 1889, the News-Letter noted, “the number of Valentines received and sent from the local post-office yesterday showed a decided increase over last year. Batchelder reports a very satisfactory sale.” The postcard craze of the 1890s gave Valentine’s Day a boost throughout the country. Costing only a penny to buy and a penny to mail, people happily sent cards not only to sweethearts, but to children and family members as well. In 1909, young Betty Tufts recorded, “got 28 Valentines in all, 9 at school.” Valentine’s Day parties became quite popular around this time, and since then the ritual of opening and sorting the little cards has become part of the school year tradition. In the early 1970s, the classroom party included cookies, cupcakes and Hawaiian Punch. Probably kids today have healthier snacks, but sources from both Lincoln and Main Street schools in Exeter indicate that they still exchange Valentine cards in school. But maybe a card wasn’t enough. 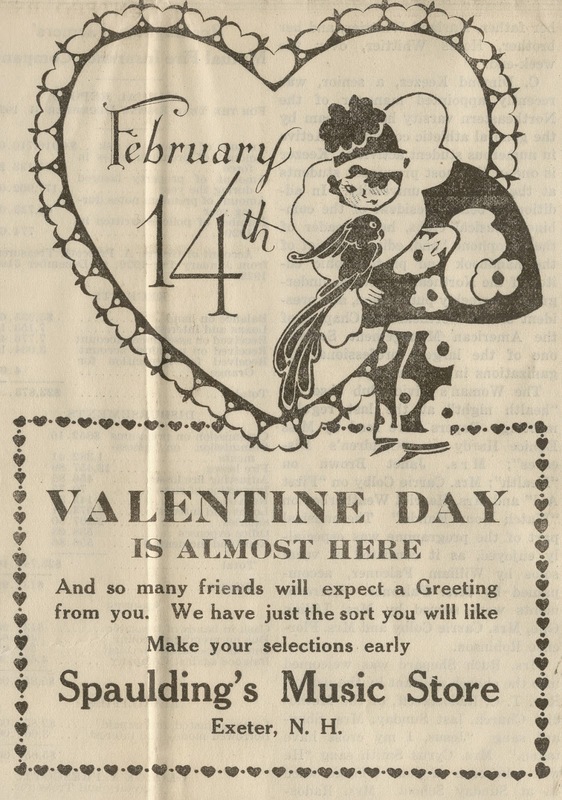 “The best Valentine of all,” encouraged Hilliard’s Flowers, “and the most appreciated is the gift of flowers.” Seward Drug store went with the candy angle offering “Valentine Hearts by Whitman, Colecrest, Lowney and Apollo” along with a counter full of perfume selections. Valentine’s Day competed with both Lincoln and Washington’s birthdays. It’s not like these two long-deceased presidents threw a wet blanket on mid-winter fun – the Washington’s Birthday Ball was a common event – but Valentine’s Day added something that the patriotic holidays couldn’t have – expressions of love. If nothing else, this is something we could all use to break out of our cabin fever during these cold, snowy weeks, and with the beginning of Lent breathing down our necks, February 14th is as good a day as any to enjoy some cupcakes with friends.